Though known as a gambling town with inexpensive hotel rooms south of Las Vegas, Laughlin is actually a bustling community with plenty of outdoor recreation. Anglers here have caught record-sized bluegill and sunfish, and rainbow trout and striped bass are other popular catches. The most plentiful fishing is in waters of the Colorado River, but Lake Mohave, less than 4 miles north of Laughlin, also has year-round fishing. A number of different species live in the Colorado River, including rainbow trout, black bass, striped bass, flathead catfish, bluegill, black crappie, sunfish and walleye. Razorback sucker and the bonytail chub are federal protected species living in the river; flannelmouth sucker is a non-game species. Return catches of these fish to the river and report the catch to state or federal resource management agencies. Lake Mohave, part of the Lake Mead National Recreation Area, is contained by Davis Dam just north of Laughlin. Close to 100 secluded coves on both the Arizona and Nevada sides of the lake provide for great fishing. Rainbow trout and striped bass are the major sport fishes, with largemouth bass, smallmouth bass, channel catfish, and sunfish also swimming in abundance. Only the Colorado River separates Nevada from Arizona at Laughlin. 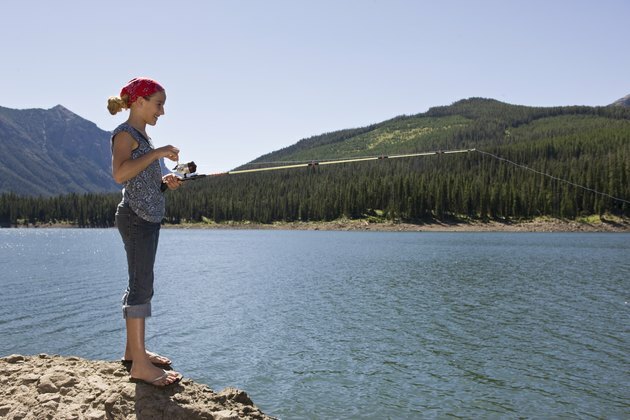 If you plan to fish the river solely from the Nevada shoreline, you must have a valid Nevada fishing license. Boat-based anglers must have either a valid Nevada license with a Colorado River Special Use Stamp from Arizona, or a valid Arizona license with a Nevada-issued Colorado River Special Use Stamp. You can get an Arizona license at marinas and tackle shops in Bullhead City and Fort Mohave. Note that if you are going after trout, you'll need an additional license. Nevada law allows an angler to fish with a second rod, line and hook as long as he or she has a paid for and received a "second rod stamp" from a licensed dealer. Baited hooks or fly hooks are limited to three or less on a single line; two lures or two plugs can be used per single line. All lines in the water must be attended. In Arizona’s waters, a similar stamp for two poles is issued. Use no more than two hooks, two lures or two flies per line in Arizona. Check with Nevada or Arizona game and fish departments for up-to-date information on catch limits and restrictions. Generally, only striped bass have length limitations in Lake Mohave: You can bag up to 20 stripedbass measuring 20 inches or more. Bag limits on other species, which do not have length restrictions, include, as of 2014: trout, 10; black bass, six; catfish, 25; crappie, 15. Other species have no limits on size or possession. Below Davis Dam, possession limits are similar, except that the striped bass limit is 10. Note that black bass must be at least 13 inches long. Set up a tent or an RV campsite in the Big Bend State Recreation Area, a Nevada state park 5 miles south of Laughlin. Fish from the shore or launch a private boat into the river; nonanglers in the family have 4 miles of trails to hike. Or, get a site in the campground at Katherine’s Landing on Lake Mohave and rent a fishing boat from the marina nearby.